GreenBrook have introduced two new handy lighting connectors. 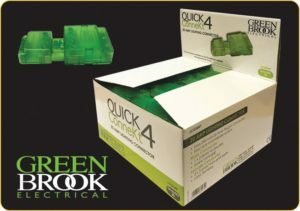 The Quick Connect 3 and the Quick Connect 4 are great time saving products – useful for all your connecting requirements including downlights, transformers, dimmers and control gear. These easy to use 250 Volt, 20 Amp, plug-in connectors feature a simple lock and release system. The male connector offers 1 x 2.5mm2 3 core flex (on 3 pin) and 1 x 2.5mm2 4 core flex (on 4 Pin) and a screw cord grip, and the female connector offers 3 x 2.5mm2 twin and earth with loop terminals. The 4 pin connectors are especially useful when installing emergency lighting. As well as offering a one-year warranty, both of these connectors are delivered to wholesalers in their own attractive Point of Sale box – ideal for sitting on the trade counter!